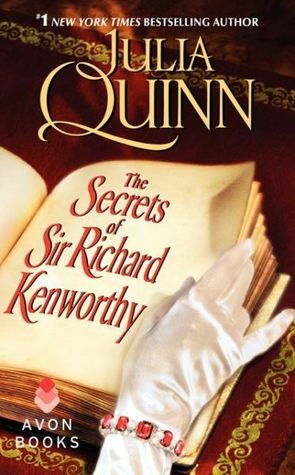 Julia Quinn's newest novel, The Secrets of Sir Richard Kenworthy, continues the Smythe-Smith collection of love stories. With humor, mystery, and scandal, readers of Quinn will surely enjoy this latest installment. Iris Smythe-Smith and Richard Kenworthy are the main players in this theater of necessary marriage. Iris is a sarcastic, witty woman who has the highest regard for family. She's intelligent and quiet, loves reading and people watching. Readers will connect with her easily as they see her evolve from a shy girl hiding behind a cello to a wife who doesn't think twice about quipping with her new suitor. Richard Kenworthy is a baronet who must find a wife. Why? Well, I won't spoil the plot for you. Let's just say he does a have a secret and it's a big one. (Though not his alone...) Richard is also witty and up for playful banter when he isn't trying to charm his way toward a wife. He's a planner of the detailed sort, but quick to change tactics when the mood strikes him. Readers will enjoy his focused plan of making Iris his wife which provides laugh out loud humor and evokes understanding. The mystery of Richard Kenworthy is an intriguing aspect of the plot as readers will be uncertain how much they can trust him. But he is a good man, underneath the pile of evaded questions. The plot is a delicious tale of family and falling in love. As soon as Richard lays eyes on Iris Smythe-Smith at the horrid family musicale, he knows that she will be perfect for his plan. He begins to court her and not too soon after, the two are quickly married with a special license. Though Iris knows that Richard made sure they would be married posthaste, she has no idea why. Thus begins the fun of Richard trying not to seduce his new wife while also attempting to make her fall in love with him. Readers who have followed the Smythe-Smith series will not be disappointed in this fourth book.